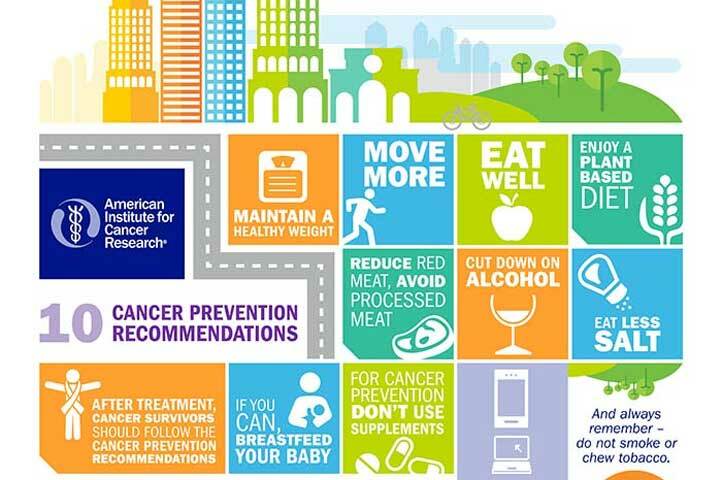 The American Institute for Cancer Research (AICR) encourages everyone to follow certain recommendations for a healthy lifestyle, which can help prevent the development of cancer (and other disease). But how much does following those recommendations actually help? While we don’t have statistical evidence for every type of cancer, we can give you an answer with regard to colorectal cancer. A recent study, published in late October of this year in Cancer Causes & Control, reveals that the more AICR Recommendations were followed, the lower the risk. One of AICR’s recommendations that is most strongly linked to reduced colorectal cancer risk, for both men and women, is cutting processed meat, but, ultimately, the more healthy recommendations followed, the lower the risk. In the recent study, researchers analyzed data from 67,000 participants of the VITamins And Lifestyle Study. Participants, aged 50 to 76 years, were cancer-free and answered particular questions about their diet, weight, and other lifestyle habits, at the beginning of the study. The study scored whether each participant met AICR’s Recommendations regarding physical activity, body weight, alcohol, plant foods, energy density, and processed and red meat. Approximately eight years later, 546 of the 67,000 participants had been diagnosed with colorectal cancer. While taking BMI and other recognized risk factors into account, it was determined that meeting one to three of AICR’s Recommendations lowered risk by a little more than one third. Meeting four to six of the recommendations lowered risk by around half. 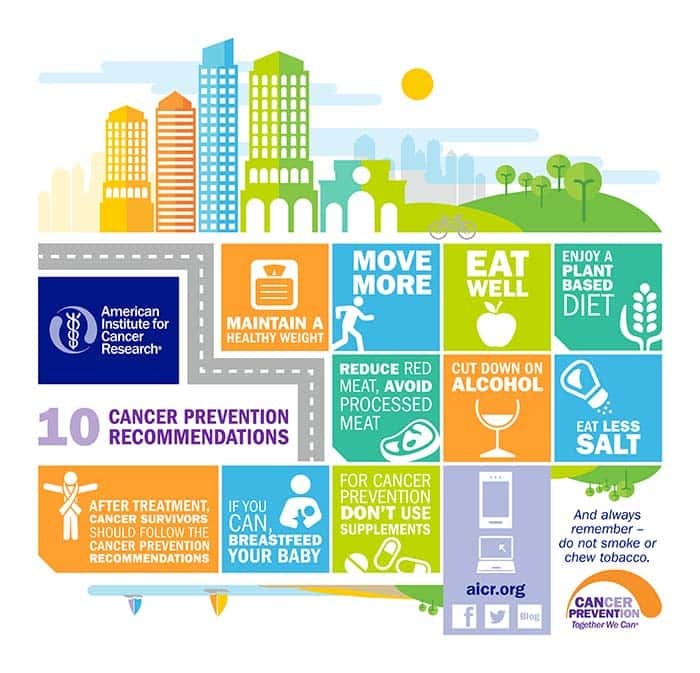 With these numbers, we expect if participants followed all 10 AICR Cancer Prevention Recommendations, their risk of developing colorectal cancer would be drastically reduced. In this particular study, the recommendations that were most strongly associated with reduced colorectal cancer risk for men were red and processed meat and alcohol; for women, body weight and, like men, red and processed meat. We underestimate how much we can actually do to safeguard our health. Leading a healthy lifestyle is the only way to have a vibrant, full life. Being aware of risk factors is also important. Inherited cancer risk factors do exist for some people but knowing that they’re there can help us make the necessary preventative choices to stay strong and healthy. Do You Have These Cancer-Fighting Foods In Your Kitchen? While research continues, there is compelling evidence that a diet filled with certain foods can help lower a person’s risk for various cancers and even help fight the cancer itself. Eating a well-balanced diet with a variety of whole foods is the way to go if you’re looking to optimize your health. — Eat whole grains instead of refined grain products (e.g., brown rice instead of white rice). — Eat 5 or more servings of fruits and vegetables every day. — Limit your intake of red meat. — Limit alcohol to one drink per day (women at high risk for breast cancer should consider not drinking alcohol at all). Following the general recommendations above is step one. The next step is including those specific foods that provide the highest cancer prevention benefits. This typically means they are high in antioxidants, substances that remove and neutralize free radicals that can damage cell membranes, affect DNA, and even destroy cells. The list from AICR is not exhaustive. Research is continuously being conducting on the effects of certain foods, or compounds within those foods, on cancer. For example, City of Hope researchers have found some possible “superfoods” with cancer-fighting properties. These superfoods have the ability to block the hormones that support the spread of cancer, diminish existing tumors, and boost the body’s immune system. 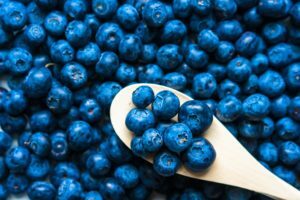 The five main superfoods identified by the researchers are pomegranates, mushrooms, blueberries, grape seed extract, and cinnamon. The foods you eat may fight cancer both directly and indirectly. Many minerals, vitamins, and phytochemicals possess direct anti-cancer properties, actually impacting cancer cells themselves. However, evidence suggests that it is substances working together in a person’s diet that offers the strongest cancer protection. At the end of the day, a healthy diet with plenty of fruits, vegetables, whole grains, and lean protein will put you on the path to good health.